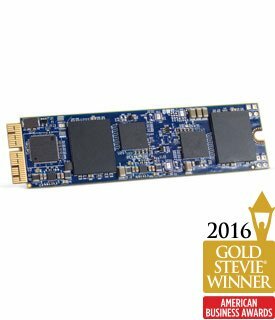 For the first time, upgrade the PCIe-based flash SSD in your mid-2013 or later MacBook Pro with Retina display or MacBook Air with up to eight times the original capacity. The new Aura SSD continues OWC's dedication to giving you more from your Mac. Aura PCIe-based flash storage upgrades are precisely engineered for your Mac, so you'll never need to compromise your data by relying on complicated software hacks or TRIM-enablers to get the most from your upgrade. Just install, migrate your data, and enjoy the great performance of flash storage with up to eight times the capacity of the factory-installed drive. Aura SSDs are designed from the ground up for reliable performance and complete compatibility with your Mac. It begins with choosing the highest-quality components, and then engineering a perfect-fit solution that simply works with your computer. Tier-1 Flash - Aura SSDs use only top-rated flash for superior performance and dependability. Aura SSDs provide three levels of error correction for improved reliability and RAID-like protection for your data. OWC SSDs perform maintenance tasks in the background that optimize the health, performance, and endurance of your flash drive. These jobs take advantage of available, unwritten areas on the SSD. Aura PCIe-based flash storage reserves 7% of the overall capacity as free space. Always. With this allocated free space, Aura SSDs can perform these normal maintenance tasks making your drive more stable, dependable, and ultimately a safer place to store your data. Aura SSDs for Mid-2013 and Later Macs are proudly designed in Austin, TX, and are backed by a 3-year limited warranty as well as a lifetime of free, award-winning USA-based support.